When Edward Hopper’s retrospective at Tate Modern in London closed in September 2004, more than 420,000 tickets had been sold. Up to that point, only the acclaimed duo of Matisse and Picasso had beat this record. It is now 50 years since Hopper died and his popularity hasn’t waned. What is it about Hopper’s brand of melancholy that has struck a chord with so many? Walking through the rooms of the exhibition was both exhilarating and dispiriting. The vivid colours of Automat (1927) and Nighthawks (1942) against the contrasts of light and shade were sharp, suggestive and familiar. The images of lone individuals in impersonal spaces, with hollowed and dark eyes gazing from windows or down at their drinks, are combined to remind spectators that the default state of humanity is isolation. In Hopper’s works, even a buzzing city doesn’t remedy isolation, but heightens it. Born on July 22 1882, Hopper later became a prolific artist. His works depict urban loneliness, disappointment, even despair. Hopper continues to be regarded as an important painter of the “American Imagination”, a phenomenon which his urban paintings capture. In a transforming America of the 20th century, his brand of Americanism offered a counterpoint to American optimism. In this regard his work can be considered alongside the film noir of the 30s and 40s, and the work of writers such as Raymond Chandler. 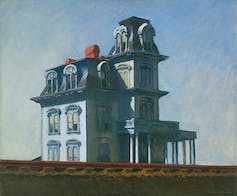 Like Hopper, the creators of noir and detective texts were concerned with the negative effects of urbanisation and increasing economic disparities. At the heart of Hopper’s urban vision are the paradoxes of the foundational democratic myth. We are all created equal, and yet what makes us equal is our absolute, inviolable uniqueness and individualism. Despite the melancholy and longing that haunts Hopper’s paintings, his popularity and influence endure. Hopper’s paintings were a source of inspiration for his contemporaries and beyond. In popular culture, he influenced a diverse range of artists including Alfred Hitchcock, who drew inspiration from his 1925 House by the Railroad for the famous Bates Motel in the latter’s 1960 film, Psycho. Traces of Night window (1928) can be spotted in Hitchcock’s 1954 film, Rear Window, which features Jeffries, a news photographer, whose “world shrunk down to the size of a window”. Sitting from his apartment, he observes Miss Lonely Hearts, a woman “so lonely that even death seems like a friend”. Nighthawks is perhaps Hopper’s most referenced work in popular culture, influencing Tom Waits’ 1975 live album, Nighthawks at the Diner. Hopper’s cultural reputation was surely cemented when the same diner from Nighthawks was reinvented as Moe’s Bar in Episode 18 of Season 8 of The Simpsons. The haunting power of Hopper’s art derives from his particular brand of realism, one which is sparse, disinclined toward extraneous detail and, ultimately, characterized by what the painting seems to omit rather than what it represents. He turned iconic American spaces such as diners, drug stores, hotel rooms, gas stations and movie theatres into spaces reflective of the artist’s interior realm, spaces of mood, feeling, contemplation of one’s position in the world. Behind the apparent simplicity of the paintings lies great complexity and depth. The lack of details invites the spectator to complete the image by speculating on past and impending events, on the relationships between the characters, and on the desires and anxieties provoked by our own need to examine these characters’ lives. Perhaps this is why “voyeurism” is an overused term in Hopper criticism. 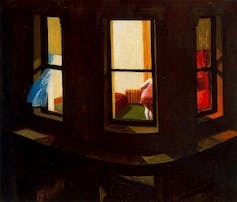 A painting such as Night Windows (1928), which positions the viewer in a first-floor apartment looking across at a woman bending over in the room opposite, might be superficially considered voyeuristic, but it is better understood as a meditation on the need for connection, and the difficulty of reaching out and connecting with others. It’s as much a picture of our own sense of isolation (and, of course, Hopper’s) as it is a picture of a vulnerable lone woman. Hopper’s earliest influences included the French Impressionists, particularly Edgar Degas. From these artists Hopper took a fascination with the play of light and a desire to create feelings and ideas in the viewing eye, rather than provide too many representational details. Another important influence was Robert Henri, who taught Hopper at the New York School of Art from 1900. Henri, whom Hopper called “the most influential teacher I had”, was part of the “Ashcan School” of American realist painters. He too was dedicated to an unsentimental depiction of a diverse New York City and came into prominence in the early 20th century. The group also included William Glackens, John French Sloan and Everett Shinn. More than this, though, Hopper’s paintings also create a space in which the viewer’s own inner life can be regarded. So when we look at another person, Hopper’s paintings invite us to ask, what exactly are we looking at? Reflections of ourselves, our desires, dreams and worries? Or somebody utterly other, someone we can never hope to understand or come close to? Are these two things, in the end, the same? Abstract expressionists such as Jackson Pollock and Mark Rothko might have captured more boldly and viscerally a post-war, post-Holocaust America, and the pop artists might have engaged more explicitly with American commodity culture, but Hopper’s work continues to entrance because it explores so sincerely these fundamental questions about identity and interpersonal relations.